Margherita Pizza has always been one of my favorite kinds of pizza. It just takes a few simple ingredients and you get insanely delicious results! 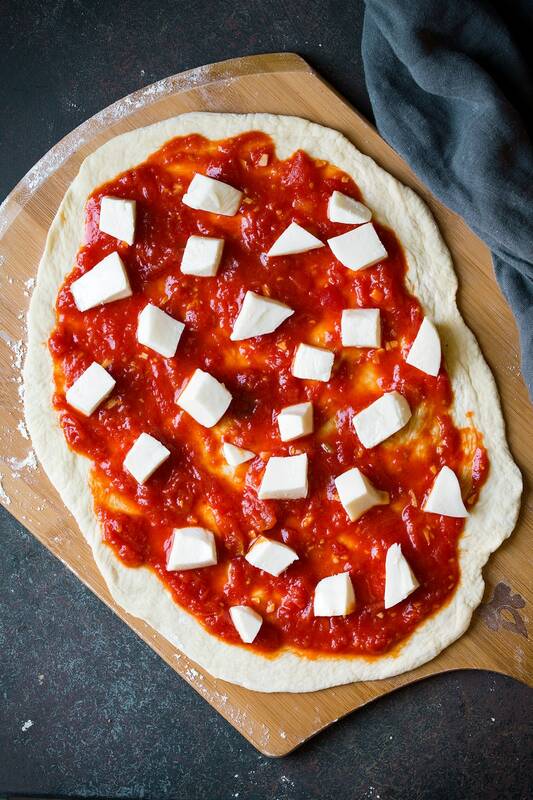 You just can’t go wrong with that tomato, basil and fresh mozzarella combo. There are many recipes out there for homemade margherita pizza, but this is how I like to make mine. Nothing but a simple pizza crust, some San Marzano tomatoes, evoo, garlic, fresh mozza and lots of fresh basil. Simple ingredients, yet a seriously flavorful end result! Most recipes just use the tomatoes straight from the can, but I like to simmer them and reduce some of that excess liquid for a more concentrated flavor — and so there’s no soggy crust. I also add extra virgin olive oil and garlic to the sauce, which isn’t so common either. Why wouldn’t we add it though? More flavor! Here, I cheated and used a store-bought pizza dough to save time. But not the kind that’s in a package with lots of random ingredients, just the kind the bakery or deli makes (it should consist of flour, water, yeast, olive oil, salt and sometimes sugar but nothing else). I’ve found them at Trader Joes and Winco, fyi. The only drawback to this vegetarian pizza recipe is that you can only bake one pizza at a time unless you have two ovens and two pizza stones. But margherita pizza only takes about 5 minutes to bake, so no problemo. 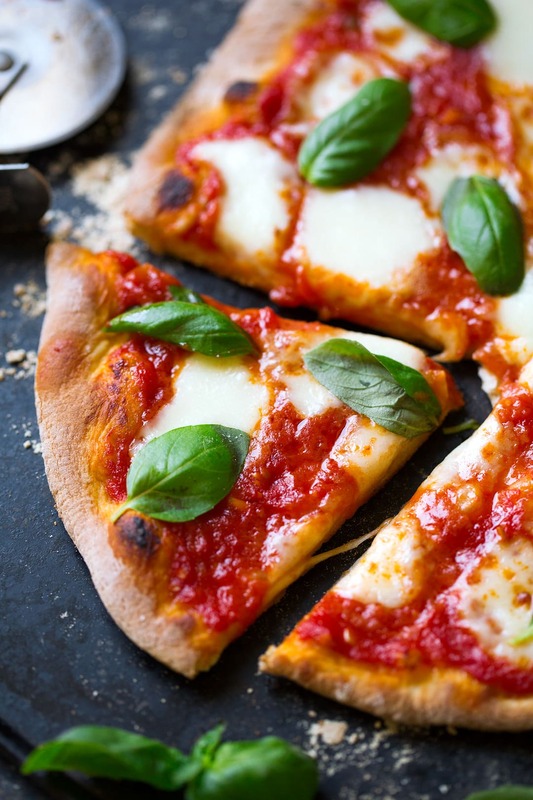 If you’ve never tried margherita pizza before, you’re missing out! 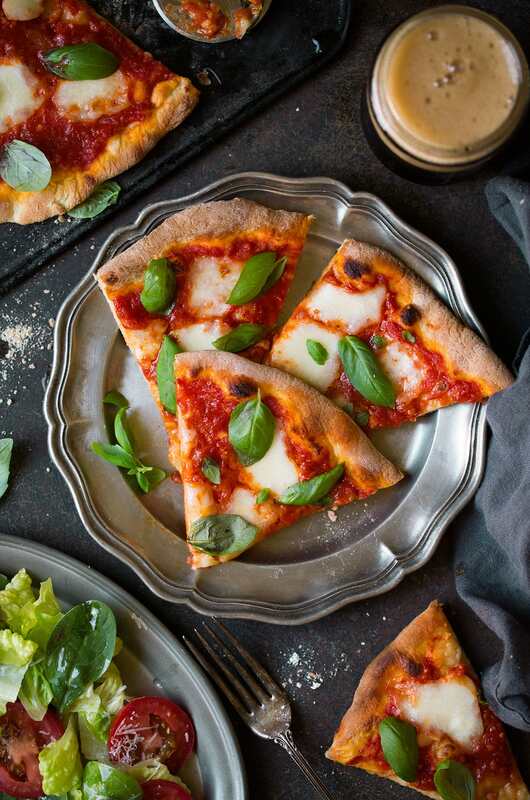 Supposedly, margherita pizza was invented in the 1800s in Naples as a way to showcase the colors of the Italian flag (red, white, and green). 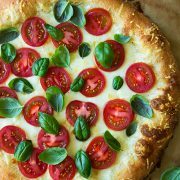 Traditionally, margherita pizza has a thin and crispy crust and is topped only with tomato sauce, mozzarella, and fresh basil. 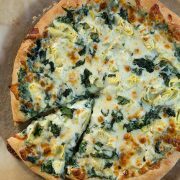 It’s a simple, yet flavorful vegetarian pizza! Heat oven to 550 degrees and let pizza stone rest in oven nearly 1 hour. Heat olive oil in a pan. Add garlic and saute just until lightly golden brown. Add in tomatoes, season with salt. Simmer about 15 – 20 minutes. Divide dough into 2 equal portions. Stretch and shape each into an oval. Lay on floured pizza peel. Spread about 1/2 cup sauce over one crust, sprinkle with half the mozzarella. Slide onto pizza stone and bake until crust is golden brown and cheese is melted. Sprinkle pizzas with fresh basil. Can I Use Canned Tomato Sauce Instead of Whole Tomatoes? Yes, but the canned San Marzano tomatoes are what make this easy margherita pizza so special, in my opinion. But if you only have tomato sauce on hand, that should work too. 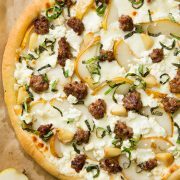 Can I Use Another Type of Cheese Instead of Mozzarella? 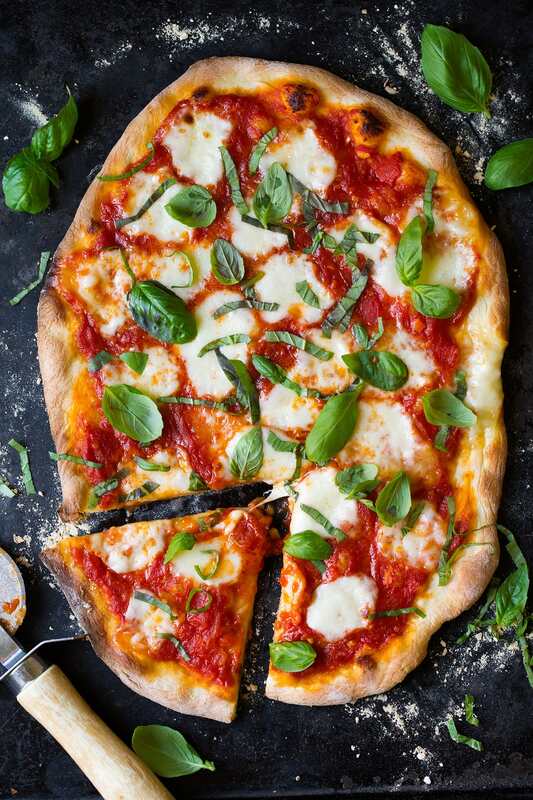 No, fresh mozzarella is a key ingredient to this margherita pizza. 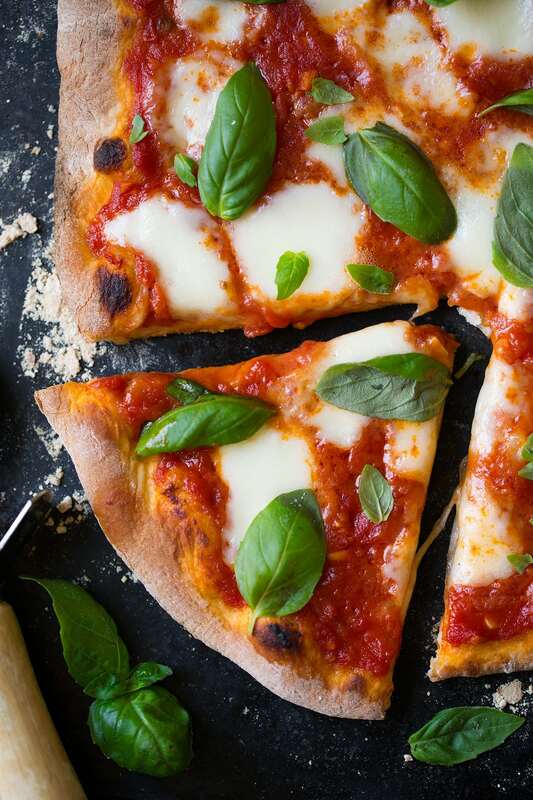 If you use another type of cheese, you’ll be making cheese pizza (which would still taste delicious, it just wouldn’t be a traditional margherita pizza). This homemade pizza is best enjoyed right away, as the crust loses its crispness over time. However, if you have leftovers simply store them in an airtight container in the fridge. To reheat this vegetarian pizza, warm it in the oven for 10 minutes on a lower heat (325 or 350), or until the cheese starts to bubble. Note that the fresh basil will wilt in the oven, so you may need to add more. If you’re using store-bought pizza dough for this pizza recipe, let it come to room temperature before shaping. Fresh mozzarella is crucial here. The pre-shredded mozzarella in the bag won’t cut it, unfortunately. Add the basil once the pizza is taken out of the oven, otherwise it will wilt and lose its flavor. 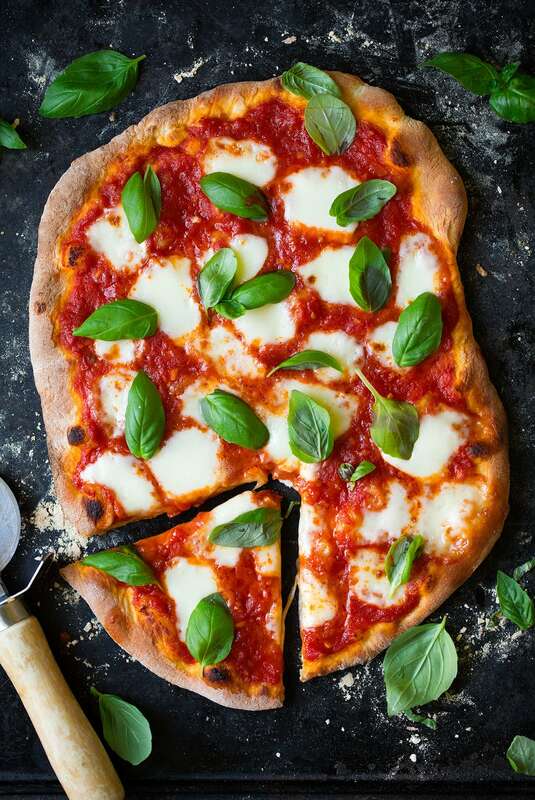 This Margherita Pizza is sure to be a hit! You get a fairly thin crust which is topped with a rich garlicky tomato sauce, lots of fresh mozzarella and plenty of fresh basil. This is how you do pizza! Heat oven to 550 degrees and place a pizza stone in the oven. Let it rest for at least 45 - 60 minutes. Meanwhile, heat olive oil in a medium saucepan set over medium heat. Add garlic and saute just until lightly golden brown, about 20 seconds. Add in tomatoes, season with salt and bring to a light boil. Reduce heat to low and simmer until reduced and thickened to nearly 1 cup, about 15 - 20 minutes. Divide dough into 2 equal portions. Note that only one pizza will be able to bake at a time. Working with one piece of dough at a time, stretch and shape into an oval about 13-inches long. Lay on a well floured pizza peel. Spread about 1/2 cup sauce over one crust, sprinkle with half the mozzarella. Quickly and carefully slide pizza from pizza peel to preheated pizza stone and bake until crust is golden brown and cheese is melted, about 4 - 7 minutes. Repeat with remaining crust. Sprinkle pizzas with fresh basil, cut into slices and serve immediately while warm. If using store-bought pizza dough, let it come to room temperature before shaping. For homemade pizza dough recipe, follow link here (you will have extra dough which you can freeze for a later use).